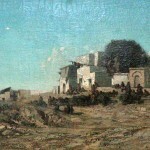 The painting Fortress in Morocco by Eugène Fromentin is part of the permanent setting of the Royal Palaces in Dedinje. It is exhibited in the White Palace, on the first floor gallery. 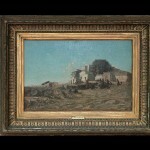 This painting was part of the initial Collection of the Palaces, and in the archival documentation it is mentioned under three similar titles Algerian Landscape, Fortress with an army and Fortress in Morocco. 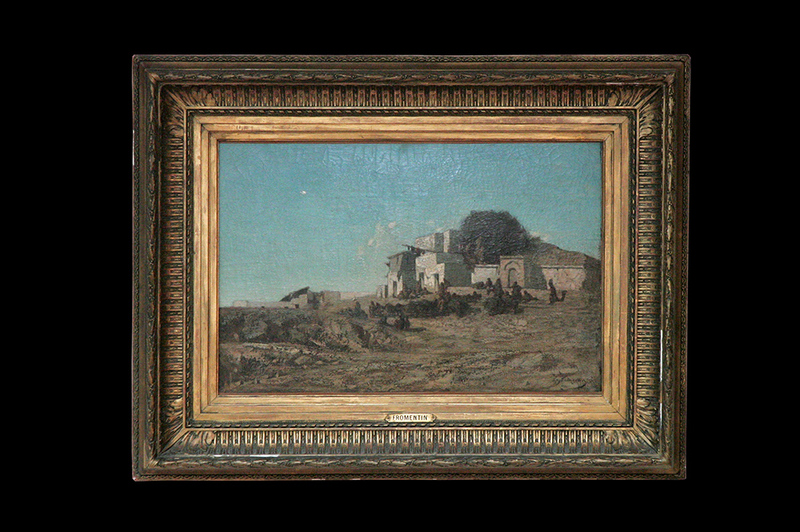 Painted in the second half of the 19th century this painting represents a typical Fromentin landscape for which he found inspiration during his visits to the North Africa. Since the middle of 18th century European artists as Eugene Delacroix or William Turner started painting historical and literary themes, as well as landscapes, inspired by exotic sceneries and cultures of Orient, North Africa and Far East. By choosing themes, which are not characteristic for European art these painters, Romantics, found a way to distance themselves from the rigorous academic art and to focus their art on the exploration of individual and emotional experiences of imaginary and real world. Eugène Fromentin was a painter of landscape scenes. In the choice of themes he followed the art of the Romantics, but by painting scenes from real life he moved closer to the ideals of impressionism. In the painting Fortress in Morocco in the completely bare landscape we see a row of buildings, of cubical form, typical for North Africa. These buildings circle a small hill to the right, and in the distance, on the line of horizon, form a fortress. In the bare space a group of people are walking. As a contrast to the bare landscape, the clear blue sky fills the upper half of the painting. 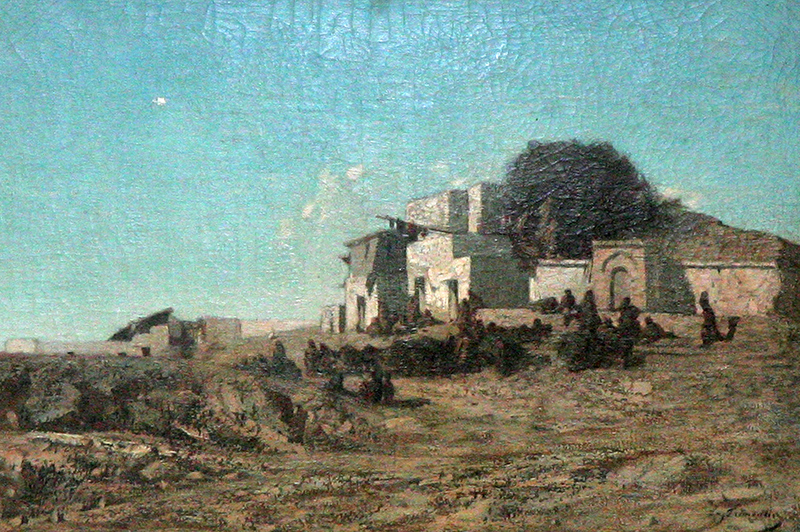 The balanced composition of the painting Fortress in Morocco is evidence of Fromentin’s classical art education. He depicts a bare landscape with buildings painted in shades of brown, whose form and colour merges with ground, while human figures, as miniature dark spots, are hardly visible. By wanting to emphasise the strongest sensation most European visitor experience when in Morocco, Fromentin chose a wide frame for the scene, disregarded the details, and placed an accent on the contrast between bare land and clear blue sky. Eugène Fromentin was a French painter and writer. He was born in La Rochelle in France. Instead of learning law, he decided to follow his fathers steps and in 1939, in Paris, he started studying art. His professors were landscape painters Jean-Charles-Joseph Rémond and Louis-Nicolas Cabat. He visited Algiers for the first time in 1946. That same year he made his debut in the Salon, showing two landscapes, one of his hometown La Rochelle, and the other of Algiers. In the next three decades Fromentin establishes himself as a painter of exotic landscapes. Landscapes, people and events, which he experienced during his travels through the North Africa, and later Venice and Holland, represent an artistic inspiration for his paintings and written works. As a painter who approached art as an ethnologist and anthropologist Fromentin aimed on giving the complete visual experience of these exotic places, which inspired him for years, therefore he always included human figure in his landscapes and city sceneries. – painted either in the distance, barely visible, or in the second plane on horse or walking. Apart from painting Fromentin was a writer. He exhibited in the Salons in Paris and wrote critical reviews as well. He published two accounts of his travels through the North Africa, and a romantic novel “Dominique” (1863). After a visit to Holland, for whose art he always felt deep sympathy, he wrote a book “Les maitres d’autrefois” (1876), an eloquent and involved visual examination of Flemish and Dutch painting.